At the outset, let me tell you of a few of my pet hates. I am not a proponent of making fun of someone else’s accent, especially when it is the name of an establishment. I am not, therefore, a fan of the name Zambar (zany south-speak for sambar). Then, I believe in a certain amount of culinary purity. In an age when our city hosts a Columbian food festival, it is unpardonable to have a South Indian restaurant with paneer on the menu, together with broccoli and baby corn. If that is your expectation from the customers in your city, it does not say much for either them or you! Let it be said that the zany name is not echoed, however faintly, in the décor, which is staid and monochromatic. I was so put off by the items on the tent card: koothu paratha with the aforementioned broccoli and baby corn that I very nearly walked out. I’m glad I didn’t. Zambar showcases the food of the four southern states, with a preponderance of dishes from Tamil Nadu. The entire staff – kitchen and service – appears to be from the south, so authenticity is spot on. And intriguingly enough, they have three sections of the menu: vegetarian, non-vegetarian and coastal. My vegetarian companion, whose enormous appetite is legendary, lost no time in ordering a Vegetarian Thali (Rs 350). The attention to detail is so minute that the rice served is Ponni rice, the preferred quality in South India. He was barely able to finish everything on the thali, so if you have a large appetite and tiny wallet, this one’s for you. The Vegetable Avial (Rs 225) was the finest version I’ve eaten in a long time, and mind you, I’m not a particular fan of this homely dish. Brinjal Gingelly (Rs 225) was almost as good, but the brinjals (the most prized vegetable in Andhra Pradesh) were too overcooked, the way they’d be in a north Indian dish. In Andhra, they are left with a little bite to them. King Fish Tawa Fry (Rs 395) was as good as it gets, the fish being almost subsumed by the spices, but not quite. However, the star of the show was the almost clichéd Chettinad Chicken (Rs 295). Many restaurants, even in Chennai, make the mistake of portraying Chettinad food as fearfully spicy. It’s not. On the contrary, home-style Chettinad Chicken is a masterpiece of flavour, including from rarely seen spices. 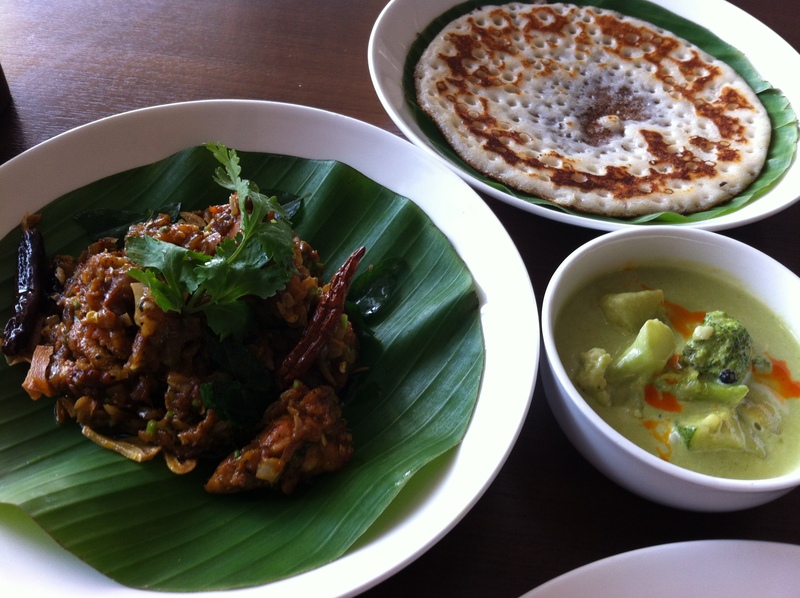 The Zambar version is as close to the Chettinad classic as it is possible to get. If you are a fan of this superb dish with its plethora of flavours, Zambar is the best you can get. The third noteworthy dish I had was Madras Fish Curry (Rs 425). Cooked with the tangy mixture of tomatoes and tamarind paste that characterizes fish curries on the east coast, it is surprisingly rare to find it on Delhi menus. I would like to take this opportunity to exhort the restaurant to stick to what they know best. Tawa Snapper Flambe with white wine, garlic and flambéed with rum sticks out like a sore thumb in a mid-range restaurant with a chef from Kanyakumari. And while they are about it, why don’t they get rid of the paneer and baby corn and do the matchless cuisine of the south a favour?